THE CERESOTA FLOUR BOY LIKED HIS BREAD! 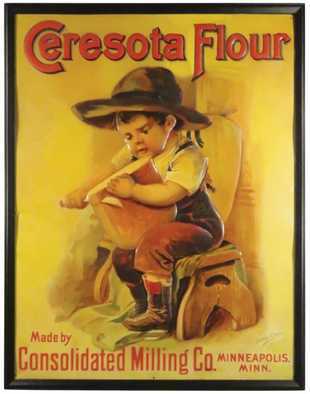 I have always liked the image the Ceresota Flour brand used in the early 1900’s of a young boy using a large knife to cut through a giant loaf of bread. The bread appears to be about the same size as the boys entire chest area! Where the parents were to help the child, or to protect him is interesting. I guess this image was designed before child service departments came into fashion perhaps? Either way, the Consolidated Milling Company based in Minneapolis, MN produced many great signs with this image. The advertising campaign obviously worked as the brand was one of the nations sellers for years. SLEEPY EYE TIN SIGN, “THE MERITORIOUS FLOUR”, MINNEAPOLIS, MN. Pictured is a beautiful tin sign for the Sleepy Eye Flour Brand, produced by the Sleepy Eye Flour Milling Company of Minneapolis, MN. Featured is a gorgeous reverse on glass advertising sign from the Fleischmann Company for their still famous yeast product. Circa 1905. 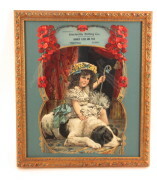 The Ghiardelli Chocolate Company based in San Francisco put out this beautiful advertising self-framed tin sign around 1900. The sign features a young girl with her doll and stuffed animals in a formal tea room like setting. Pictured is an early Victorian era die cut lithograph from the Steeleville, IL Milling Company advertising their Banner brand of Flour. Circa 1910. This is a beautiful antique porcelain sign for the Yankee Label Bread brand manufactured by The Heydt Baking Company in St. Louis, MO. Circa 1910. 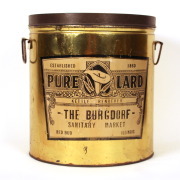 This is an early tin lard can from the Burdorf Family Sanitary Market in Red Bud, Illinois. Circa 1920. 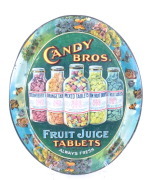 This is a rare Fruit Juice Tablets serving tray made by the Candy Brothers Company in St. Louis, MO, 1900. 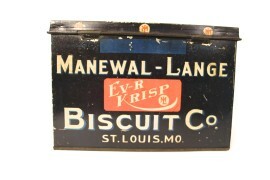 Circa 1920, a nice biscuit box from a long defunct Baking Company. This box is for their soda water cracker brands and is very colorful with the Orange coloring, somewhat unusual for that time period on early advertising items. This stained glass etched sign from Koenigsmark Milling Co in Waterloo, IL, Circa 1887, was a glass sliding door with a handle on it at one time. 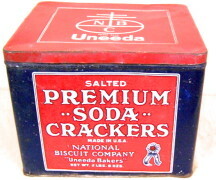 Circa 1920, the Uneeda Brand was imitated by many companies and the National Biscuit Company sued them and won all of the patent infringements. The Uneeda word was one of the most commonly used around 1900, and the product helped propel the company to the present day Nabisco Co we all know and love. A great tin box with nice color contrast on it. 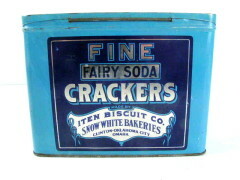 Circa 1920, The Fairy Soda Crackers tin box is a very colorful biscuit box from the Snow White Bakeries out of Clinton IA, Omaha, NE, and Oklahoma City, OK.